SDLP leader Colum Eastwood warned an ongoing “drip feed of revelations” about the Renewable Heat Incentive (RHI) was “poisoning public confidence in politics”. In excess of a billion pounds was distributed under an innocuous-looking ‘eco-friendly’ scheme to promote the use of biomass fuels. 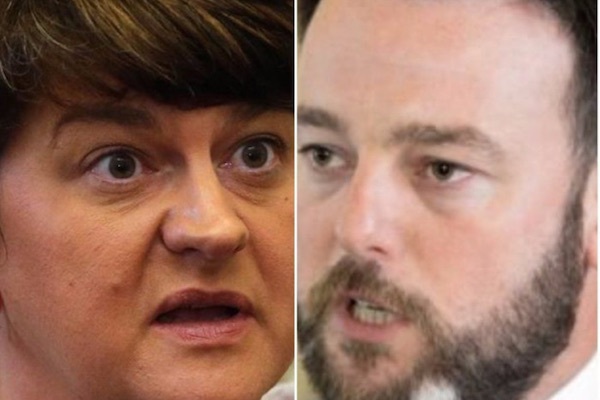 The beneficiaries included a number of prominent unionists and loyalists, their relatives and organisations linked to them, but a full list is being kept secret. Scores of giant wood pellet burners operated 24 hours a day, and some bogus RHI applicants pocketed up to 2.5 million pounds. A newspaper report this week revealed that Arlene Foster was aware of and rejected cost control recommendations from civil servants. The DUP leader has insisted she never acted against civil service advice. Mr Eastwood said the news demolishes her claims of ignorance. A judge-led public inquiry has now been set up to examine the controversy that triggered the collapse of the powersharing administration at Stormont and forced Mrs Foster from her role as First Minister. However it will not have completed its work until long after March’s Assembly election. The SDLP leader said his party would not support a Stormont Executive with Mrs Foster in a lead role while questions around RHI remained unanswered. “The truth about Arlene Foster’s knowledge and involvement in the cash for ash scandal continues to come dropping slow,” said Mr Eastwood. Meanwhile, Sinn Fein’s new northern leader Michelle O’Neill has also been forced to defend her involvement in the scheme as former head of the Stormont Agriculture department. Ms O’Neill was responding to reports that her department organised 58 workshops promoting the RHI. The workshops stressed the ‘financial benefits’ of the RHI, which returned 160% of all expenditure on biomass fuels. She said there was “widespread knowledge” of the scheme among politicians, the energy industry and the media. However, she has previously said she was unaware of how generous the scheme was until February last year and that the botched scheme was “entirely of the DUP’s making”. “When Sinn Fein became aware of the concerns around the scheme we took decisive action to end it in the interests of the public purse, despite the objections of the SDLP and UUP who voted to keep it open,” she said. The DUP said the revelation of a Sinn Fein Minister’s support for the scheme showed the upcoming election had “nothing to do with RHI”. “Despite attempts to portray otherwise, it is now clear that more than one government department was promoting the RHI scheme, including the financial incentives available,” said DUP election candidate Christopher Stalford. SDLP leader Colum Eastwood accused Sinn Fein of being aware of the scheme’s largess but waited until a media storm in December to “wake up to its significance”. He called on Sinn Fein to “open themselves up to full transparency”.